You can't tell, but this is tiny. Disney's 2012 animated epic, Wreck-It Ralph, paid tribute to many classic video games from the '80s and '90s by bringing to life some of the most beloved game characters of all time such as Q*Bert, Pac-Man and my personal fave, Tapper. 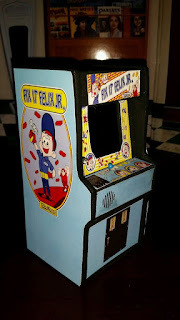 However the main story centers around a fictional creation of Disney's called Fix-It Felix Jr., a game that most likely took inspiration from the legendary Nintendo hit, Donkey Kong. In it, our titular hero takes on the task of repairing a crumbling building while avoiding the wrath of the evil Ralph, who tries to take out Felix by hurling rocks, or clumps of dirt or something at him...you know these 8-bit games make it tough to tell, sometimes. But because it was never actually a real arcade game, you retro game collectors out there can forget about getting your hands on a working model, unless one of those kit-bashers, game-hackers or MAME-floggers that live in your web browser decides to build one. I'm looking at you Ben Heck! But until that day arrives, what you can do is stop by eBay and pick up a (relatively expensive) mini-replica of the arcade game itself. This decorative miniature doesn't actually let you play the game, but it does feature an LCD screen with a video loop and sound effects and would be a worthy addition to any geek's man-cave. The bidding starts at $70, which I think is a little steep, but if you're a fan of the film, this is one collectible that you probably won't find anywhere else.